The Poly Device Management Service for the Enterprise provide central management for your Poly voice devices. PDMS-E is a key Poly Cloud Service provided by VideoCentric to help you optimise your IT resources and simplify deployment and management of devices across your network. Provided as a portal within the cloud and accessible from anywhere via the internet, you can manage from 1 to 50,000 devices securely, affordably and efficiently. Get in touch with us to have a chat about provisioning and management of devices across your network – when you are ready, we can set you up with a 60 day free trial for up to 10 of your current Poly devices, so you can try it out for yourself. Within the management portal, it’s simple to activate the features you want. Or if you want to get off the ground quick or are not sure, we provide over 400 templates and configurations to help you get started. 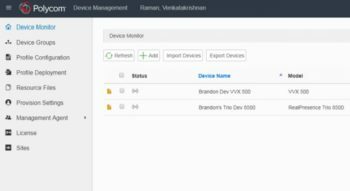 Preconfigure all your devices in bulk, or customise devices individually. You can modify credentials, speed dials and contacts for specific system types, particular locations or groups, so you can ensure both a consistent experience and an experience specific for the needs of particular teams and workspaces. The PDMS-E cloud service ensures reliable voice communication systems are managed, optimised and simple. With unparalleled automation and security, you’ll simplify staging, deployment and management for all your Poly devices, wherever they may be. Get in touch today to find out more.